Our Millwork Shop can not only build beautiful reclaimed furniture but having this facility on site also allows for us to offer custom, handmade stair treads to go with your custom flooring order. 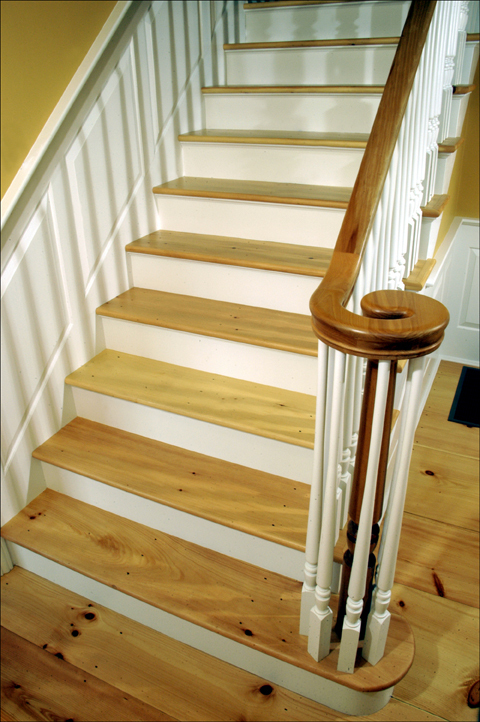 We can do a full stair case or simply one step to help you transition to the next room. We glue up our treads from the same wide plank material, ensuring a consistent look and added integrity. We can pre-finish the treads here or we can provide you with a fully assembled tread, ready to be finished in place, along with the rest of your unfinished flooring. These treads can be ordered to match any of our Classic Plank or Reclaimed Plank Flooring options. Contact Us to begin this process. We are also always willing to work with your builder, contractor or finish carpenter to ensure that each specification is precisely met. Stairs can be a daunting task and we understand the need for exact measurements and clear communication.